Is it possible to have a main menu of one hud and the ingame gameplay of another?If so how can I do that? How do I change the color of the damage numbers in broeselhud blue? There are no numeric rgb values, just names. "fgcolor"	"0 0 0 255"
Just replace those aliases for RGBs, it wont kill anything. SmesiJust replace those aliases for RGBs, it wont kill anything. How do I remove the thing in the lower box and how do I edit the position of the thing in the top box? ShpeeismeHow do I remove the thing in the lower box and how do I edit the position of the thing in the top box? [quote=Shpeeisme]How do I remove the thing in the lower box and how do I edit the position of the thing in the top box? what do you mean with the label? the higher box? He's talking about the second box down. The first box is targetid.res I believe. STOGEThe first box is targetid.res I believe. Smesi ShpeeismeHow do I remove the thing in the lower box and how do I edit the position of the thing in the top box? [quote=Smesi][quote=Shpeeisme]How do I remove the thing in the lower box and how do I edit the position of the thing in the top box? Yeah, if someone could get a fix for this it would be sick. The only fix is not using mat_phong 0. Seriously. I tried EVERYTHING. I couldn't get them to work properly without mat_phong being set to 1. Where do I change the lifetime of this without changing lifetime of my floating damage numbers? Is it possible to add scroll bars to elements? I just want a scroll bar on my MOTD panel. I know there is one by default but I can't find the controlling element in textwindow.res and I don't particularly like its style anyway. Is it possible to change the chat font? If so, where? ShpeeismeIs it possible to change the chat font? If so, where? ChatFont in clientscheme. All font definitions are contained in clientscheme. Pretty sure they are tied together. It would be in hudammoweapons, the delta_lifetime parameter. [quote=Shpeeisme]Is it possible to change the chat font? If so, where? Probably a dumb question but what is the element for contracts called? EoNProbably a dumb question but what is the element for contracts called? The button itself? That's in mainmenuoverride, called QuestLogButton. Have a short qns here! How do you change the colour when you get 1 kill/death or more from green to white? Look at the 1 on the scoreboard, its green n how do i make it white? Btw it is the death counter. KqiHave a short qns here! [quote=Kqi]Have a short qns here! Jerm KqiHave a short qns here! [quote=Jerm][quote=Kqi]Have a short qns here! 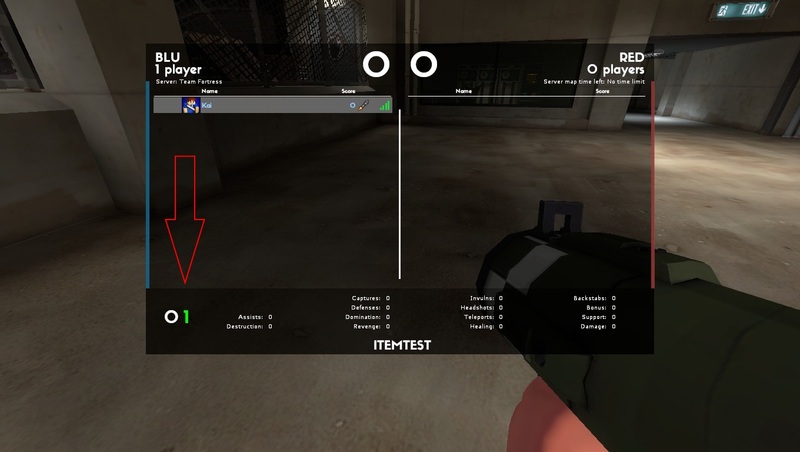 How do I change the length of the player's name on the scoreboard? I tried messing with name_width in scoreboard.res but nothing worked. 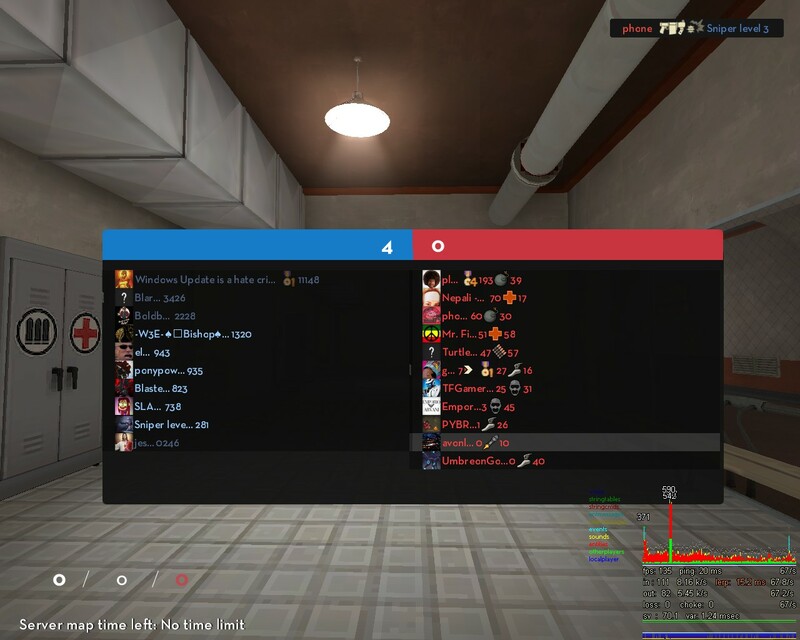 RainmanHow do I change the length of the player's name on the scoreboard? I tried messing with name_width in scoreboard.res but nothing worked. Looks like you still need to add the "medal_width" line next to name_width. That said, you can't change the name lenght any more since this last update. [quote=Rainman]How do I change the length of the player's name on the scoreboard? I tried messing with name_width in scoreboard.res but nothing worked. so I am stuck with one letter names? Have you added in the medal_width line and it hasn't changed anything? _KermitHave you added in the medal_width line and it hasn't changed anything? My medal_width is set to 2. Smesi Jerm KqiHave a short qns here! I did try to change the fgcolor to "255 255 255 255" however there must be another file that is causing the numbers to be green cause it still remained green when I killed myself. Tried looking through the animations file, could not find anything related to the colours changing from white to green when the kill/death count is above 0. [quote=Smesi][quote=Jerm][quote=Kqi]Have a short qns here! Kqi Smesi Jerm KqiHave a short qns here! I actually messed up the elements you have to rename, my bad. Basically, make a copy of Kills and Deaths (not KillsLabel and DeathsLabel), turn the original Kills and Deaths to visible 0, and make the copy of your kills and deaths a different name like "KillsNotGreen" and "DeathsNotGreen". As long as your elements aren't called Kills and Deaths, they won't turn Green when they're non-zero. [quote=Kqi][quote=Smesi][quote=Jerm][quote=Kqi]Have a short qns here!